I’ve been given a great opportunity to be part of an Artists Showcase that is taking place April 2, at the Fremont Foundry. It’s going to be quite a party, with bands, fashion designers and visual artists showing off their creations. RAW Artists was created several years ago to help emerging artists get exposure and I’m really excited that they sought me out to join their showcase. If you would like to support my art (whether or not you can attend) you can purchase a ticket on my RAW artist page for $15. The only cost to me for the show is the agreement to sell 20 tickets by March 25th. I have to make up the difference for any I do not sell. I will have several paintings on display as well as some prints available for purchase. Thank you all for all the support you give me, in the form of likes and comments. The encouragement means so much!!! Hope to see some of you there! Thank you!!! 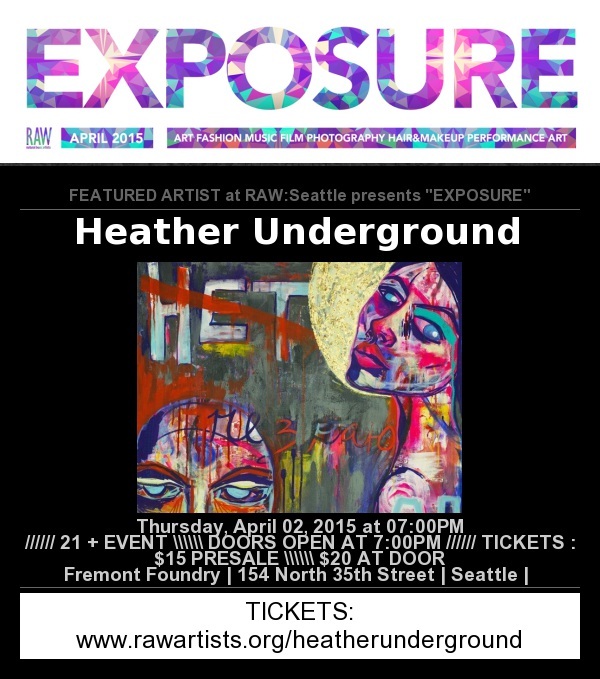 This entry was posted in General and tagged art, art show, Fremont Foundry, Illustration, Painting, RAW, RAW Artist, Seattle, Seattle artist, tickets for sale by heatherunderground. Bookmark the permalink. Aside from my own work, from time to time I will be sharing things that I love and that inspire me. I absolutely adore this amazing artists work! If you are in the Seattle area on the 2nd of April you might like to support the wonderful Heather Carr. She will be showcasing her work alongside other artists at the Raw event and I hear there will be food, drink and live music too… Follow the link in the article to purchase your entry ticket (only $15) but if you can’t make it and you love what you see, please consider a ticket purchase as this will support her entry into this wonderful event. I hear she is halfway to fulfilling her ticket allocation to cover her entry fee, so a ticket purchase would go such a long way to help her. Hope you can support her and make it to what is sure to be a fantastic evening of art. Thank you. I can’t go (I’ll be in Spokane) but I will buy a ticket if you come on by the brig.